Airola, Paavo, N.D., Ph.D. How to Get Well. Sherwood, OR: Health Plus Publishers, 1974. ______. How to Keep Slim, Healthy & Young With Juice Fasting. 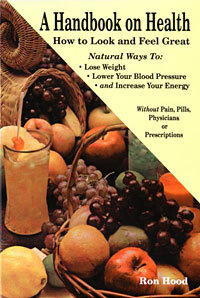 Sherwood, Or: Health Plus Publishers, 1996. Brecher, Elinor J. “Experts Are Sounding Alarm About Job Stress.” Greenville News 25 March 1993: 1, 11B. Clarke, Charles S. “Job Stress.” CQ Researcher. 5 (1995): 683-699. Colvert Bayly. “Living Smart, Staying Healthy,” Taped messages. Niles, Illinois: Nightingale-Conant Corp., 1997. Diamond, Harvey and Marilyn. Fit For Life. New York: Warner Books, 1985. Editors of FC&A. Take Off 20 Pounds and 20 Years in 20 Weeks or Less, Naturally. Peachtree City, GA: FC&A, 1995. ______. High Blood Pressure Lowered Naturally. Peachtree City, GA: FC&A, 1995. Kirschmann, John, D. Nutrition Almanac. New York, NY: McGraw-Hill Book Company, 1973. Kramer, Ann, M.Ed. Taking Charge Of Your Nutritional Lifestyle. Newport News, VA: Well-Being Inc., 1992. ______. Life Puzzle Newport News, VA: Well-Being Inc., 1998. Lambert, Bobbi. “Give Your Company A Checkup.” Personnel Journal 74 (1995: 143-9. Malkmus, George. Why Christians Get Sick. Shelby, NC: Hallelujah Acres. ______. “God’s Marvelous Self-Healing Body.” Back to the Garden Magazine. Shelby, NC: Hallelujah Acres, 1999. ______. “How To Eliminate Sickness.” Taped messages. Shelby, NC: Hallelujah Acres. McLaughlin, Peter. “Unlimited Energy” Tape series. Niles, Illinois: Nightingale-Conant Corp, 1996. McMillen, S.I. M.D. None Of These Diseases. Old Tappan, NJ: Fleming H. Revell Co., 1986. Omartian, Stormie. Greater Health God’s Way. Eugene, OR: Harvest House Publisher, 1996. Roloff, Evang. Lester. Food, Fasting & Faith. Corpus Christi, TX: Family Altar Publishers, 1997. Smith, J. Harold. Fast Your Way To Health. Nashville, TN: Thomas Nelson Publishers, 1979. “Stress and Type ‘A’ Behavior.” Stress. Sept./Oct. 1987: 1-2. Stuberg, Robert. The 12 Life Secrets. Book & taped messages. Niles, Illinois: Nightingale-Conant Corp, 1997. The Body in Action. New York, NY: Golden Press, 1962. (Text adapted by Ann Reit). “The Cost of Stress.” Success. March 1995: 19. Wallach, Joel D, BS, DVM, ND. “Dead Doctors Don’t Lie,” taped message, 1995. Wallis, Arthur. God’s Chosen Fast. Fort Washington, PA: Christian Literature Crusade, 1968. Watkins, Don. Science 4 For Christian Schools. Greenville, SC: B.J.U. Press, 1998. Weiss, Rick. “Reactions To Prescribed Drugs Kill 100,000 a Year,” Greenville News: Greenville, SC, April 15, 1998. Whitaker, Julian Dr. Health & Healing. Articles from his monthly papers. Potomac, MD: Phillips Publishing, Inc. 1995. To request more information or a free brochure, contact us. You can order this book from our online catalog now. If you prefer to place an order by phone or mail, please see the bottom of this page for that information.